Wednesday November 28th 1883 Mary was not able to work this morning so went over to her Aunts. Julia came to help us with the work. I ironed in the forenoon knit in the afternoon and went to the opera house with Rob in the evening. 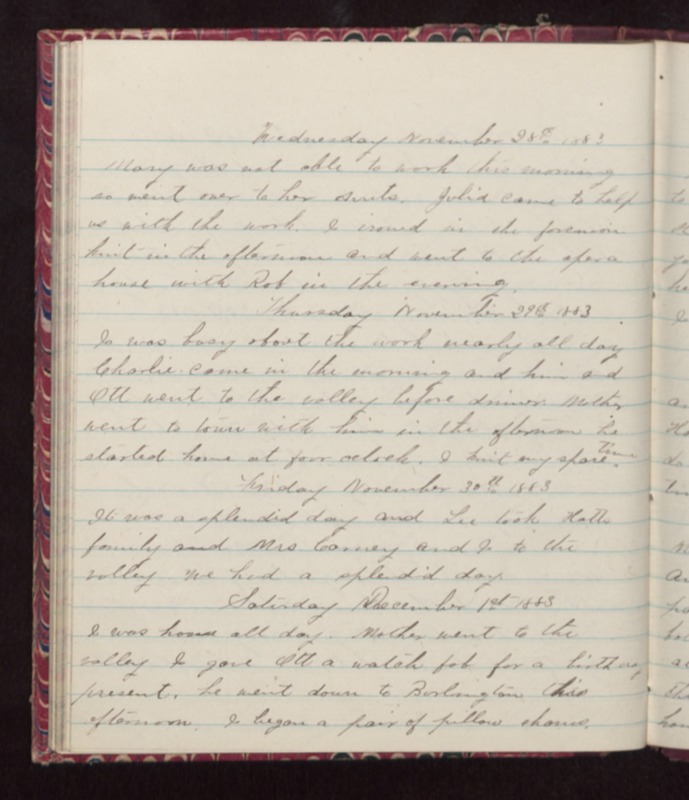 Thursday November 29th 1883 I was busy about the work nearly all day Charlie came in the morning and him and Ott went to the valley before dinner Mother went to town with him in the afternoon he started home at four oclock. I knit my spare time. Friday November 30th 1883 It was a splendid day and Lee took Hatts family and Mrs Connery and I to the valley We had a splendid day. Saturday December 1st 1883 I was home all day. Mother went to the valley I gave Ott a watch fob for a birthday present, he went down to Burlington this afternoon. I began a pair of pillow shams.